Raccoons are mischievous mammals with a characteristic white face and contrasting black fur around the eyes. Their grey coats, composed mostly of thick underfur, provide insulation against the cold North American weather. Known for their intelligence and good memory, raccoons are able to solve puzzles. They don’t have opposable thumbs, but that doesn’t stop them using their paws and powerful claws to open things, which is where their mischievous reputation comes from. They have been known to twist open a variety of handles and doorknobs and often break into rubbish bins. Racoons are native to North and Central America, although they have been introduced elsewhere and are now present in parts of Europe and Asia. Their preferred habitat includes marshes, swamps and mangrove or flooded forests, but they are extremely adaptable. They are known to inhabit anywhere they have access to water, including suburban areas. Likewise, dens can be created in a range of places, such as log piles, tree holes, on banks, in ground burrows or even in attics. Raccoons are omnivores, so they survive on a flexible diet of meat and plant foods. They are opportunistic feeders, so take what they can get, usually food that is close to or on the ground. This includes things like fruits and nuts, eggs, insects, mammals, reptiles, fish, and in suburban areas, rubbish forms part of the diet. 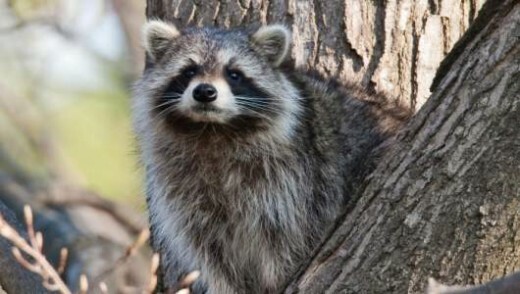 Racoons do not hibernate but can disappear off to their dens for weeks at a time in winter. They enter a state of torpor, which means whilst in their den they lower their body temperature and metabolism, reducing their energy use and food uptake, and thus their need to venture out in search of food. Sight is not particularly important to raccoons. They have poor long-distance vision and are thought to be either colour-blind or at least poor at distinguishing colour. Other senses make up for their poor sight though, with touch being the most sensitive. Their front paws are extremely sensitive to touch and the presence of specialised hairs, known as vibrissae, above their sharp, nonretractable claws, means they don’t even need to touch objects to locate them. Raccoons were once thought to wash their food before eating, but this has since been disproved. In fact, their paws become more sensitive to touch when wet, so when seen rubbing their paws together or ‘washing’ food, they are actually taking in information. Raccoons are smart animals with a great memory and a high IQ. They are excellent learners. Research has shown that not only are they able to solve problems but that they can also remember the solution and use it again years later. This causes problems in urban areas as they use their problem-solving abilities to break through locks and latches into rubbish bins and even houses in search of food and dens.